Alice's Adventures in Wonderland (commonly shortened to Alice in Wonderland) is an 1865 novel written by English author Charles Lutwidge Dodgson under the pseudonym Lewis Carroll. It tells of a young girl named Alice falling through a rabbit hole into a fantasy world populated by peculiar, anthropomorphic creatures. The tale plays with logic, giving the story lasting popularity with adults as well as with children. It is considered to be one of the best examples of the literary nonsense genre. Its narrative course, structure, characters, and imagery have been enormously influential in both popular culture and literature, especially in the fantasy genre. Alice was published in 1865, three years after Charles Lutwidge Dodgson and the Reverend Robinson Duckworth rowed in a boat, on 4 July 1862 (this popular date of the "golden afternoon" might be a confusion or even another Alice-tale, for that particular day was cool, cloudy and rainy), up the Isis with the three young daughters of Henry Liddell (the Vice-Chancellor of Oxford University and Dean of Christ Church): Lorina Charlotte Liddell (aged 13, born 1849) ("Prima" in the book's prefatory verse); Alice Pleasance Liddell (aged 10, born 1852) ("Secunda" in the prefatory verse); Edith Mary Liddell (aged 8, born 1853) ("Tertia" in the prefatory verse). The journey began at Folly Bridge near Oxford and ended five miles away in the village of Godstow. During the trip Charles Dodgson told the girls a story that featured a bored little girl named Alice who goes looking for an adventure. The girls loved it, and Alice Liddell asked Dodgson to write it down for her. He began writing the manuscript of the story the next day, although that earliest version no longer exists. The girls and Dodgson took another boat trip a month later when he elaborated the plot to the story of Alice, and in November he began working on the manuscript in earnest. Chapter One – Down the Rabbit Hole: Alice, a girl of seven years, is feeling bored and drowsy while sitting on the riverbank with her elder sister. 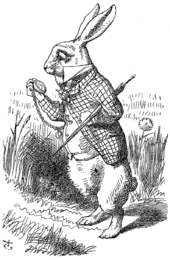 She then notices a talking, clothed White Rabbit with a pocket watch run past. She follows it down a rabbit hole when suddenly she falls a long way to a curious hall with many locked doors of all sizes. She finds a small key to a door too small for her to fit through, but through it she sees an attractive garden. She then discovers a bottle on a table labelled "DRINK ME," the contents of which cause her to shrink too small to reach the key which she has left on the table. She eats a cake with "EAT ME" written on it in currants as the chapter closes. Chapter Two – The Pool of Tears: Chapter Two opens with Alice growing to such a tremendous size her head hits the ceiling. Alice is unhappy and, as she cries, her tears flood the hallway. After shrinking down again due to a fan she had picked up, Alice swims through her own tears and meets a Mouse, who is swimming as well. She tries to make small talk with him in elementary French (thinking he may be a French mouse) but her opening gambit "Où est ma chatte?" ("Where is my cat?") offends the mouse and he tries to escape her. Chapter Three – The Caucus Race and a Long Tale: The sea of tears becomes crowded with other animals and birds that have been swept away by the rising waters. Alice and the other animals convene on the bank and the question among them is how to get dry again. The Mouse gives them a very dry lecture on William the Conqueror. A Dodo decides that the best thing to dry them off would be a Caucus-Race, which consists of everyone running in a circle with no clear winner. Alice eventually frightens all the animals away, unwittingly, by talking about her (moderately ferocious) cat. Chapter Four – The Rabbit Sends a Little Bill: The White Rabbit appears again in search of the Duchess's gloves and fan. Mistaking her for his maidservant, Mary Ann, he orders Alice to go into the house and retrieve them. Inside the house she finds another little bottle and drinks from it; immediately she starts growing again. The horrified Rabbit orders his gardener, Bill the Lizard, to climb on the roof and go down the chimney. Outside, Alice hears the voices of animals that have gathered to gawk at her giant arm. The crowd hurls pebbles at her, which turn into little cakes. Alice eats them, and they reduce her again in size. Chapter Five – Advice from a Caterpillar: Alice comes upon a mushroom and sitting on it is a blue Caterpillar smoking a hookah. The Caterpillar questions Alice and she admits to her current identity crisis, compounded by her inability to remember a poem. Before crawling away, the caterpillar tells Alice that one side of the mushroom will make her taller and the other side will make her shorter. She breaks off two pieces from the mushroom. One side makes her shrink smaller than ever, while another causes her neck to grow high into the trees, where a pigeon mistakes her for a serpent. With some effort, Alice brings herself back to her normal height. She stumbles upon a small estate and uses the mushroom to reach a more appropriate height. Chapter Six – Pig and Pepper: A Fish-Footman has an invitation for the Duchess of the house, which he delivers to a Frog-Footman. Alice observes this transaction and, after a perplexing conversation with the frog, lets herself into the house. The Duchess's Cook is throwing dishes and making a soup that has too much pepper, which causes Alice, the Duchess, and her baby (but not the cook or grinning Cheshire Cat) to sneeze violently. Alice is given the baby by the Duchess and to her surprise, the baby turns into a pig. The Cheshire Cat appears in a tree, directing her to the March Hare's house. He disappears but his grin remains behind to float on its own in the air prompting Alice to remark that she has often seen a cat without a grin but never a grin without a cat. Chapter Seven – A Mad Tea-Party: Alice becomes a guest at a "mad" tea party along with the March Hare, the Hatter, and a very tired Dormouse who falls asleep frequently, only to be violently awakened moments later by the March Hare and the Hatter. The characters give Alice many riddles and stories, including the famous 'Why is a raven like a writing desk?'. The Hatter reveals that they have tea all day because Time has punished him by eternally standing still at 6 pm (tea time). Alice becomes insulted and tired of being bombarded with riddles and she leaves claiming that it was the stupidest tea party that she had ever been to. Alice trying to play croquet with a Flamingo. Chapter Eight – The Queen's Croquet Ground: Alice leaves the tea party and enters the garden where she comes upon three living playing cards painting the white roses on a rose tree red because The Queen of Hearts hates white roses. A procession of more cards, kings and queens and even the White Rabbit enters the garden. Alice then meets the King and Queen. The Queen, a figure difficult to please, introduces her signature phrase "Off with his head!" which she utters at the slightest dissatisfaction with a subject. Alice is invited (or some might say ordered) to play a game of croquet with the Queen and the rest of her subjects but the game quickly descends into chaos. Live flamingos are used as mallets and hedgehogs as balls and Alice once again meets the Cheshire Cat. The Queen of Hearts then orders the Cat to be beheaded, only to have her executioner complain that this is impossible since the head is all that can be seen of him. Because the cat belongs to the Duchess, the Queen is prompted to release the Duchess from prison to resolve the matter. Chapter Nine – The Mock Turtle's Story: The Duchess is brought to the croquet ground at Alice's request. She ruminates on finding morals in everything around her. The Queen of Hearts dismisses her on the threat of execution and she introduces Alice to the Gryphon, who takes her to the Mock Turtle. The Mock Turtle is very sad, even though he has no sorrow. He tries to tell his story about how he used to be a real turtle in school, which the Gryphon interrupts so they can play a game. Chapter Ten – Lobster Quadrille: The Mock Turtle and the Gryphon dance to the Lobster Quadrille, while Alice recites (rather incorrectly) "'Tis the Voice of the Lobster". The Mock Turtle sings them "Beautiful Soup" during which the Gryphon drags Alice away for an impending trial. Chapter Eleven – Who Stole the Tarts? : Alice attends a trial whereby the Knave of Hearts is accused of stealing the Queen's tarts. The jury is composed of various animals, including Bill the Lizard, the White Rabbit is the court's trumpeter, and the judge is the King of Hearts. During the proceedings, Alice finds that she is steadily growing larger. The dormouse scolds Alice and tells her she has no right to grow at such a rapid pace and take up all the air. Alice scoffs and calls the dormouse's accusation ridiculous because everyone grows and she cannot help it. Meanwhile, witnesses at the trial include the Hatter, who displeases and frustrates the King through his indirect answers to the questioning, and the Duchess's cook. Chapter Twelve – Alice's Evidence: Alice is then called up as a witness. She accidentally knocks over the jury box with the animals inside them and the King orders the animals be placed back into their seats before the trial continues. The King and Queen order Alice to be gone, citing Rule 42 ("All persons more than a mile high to leave the court"), but Alice disputes their judgement and refuses to leave. She argues with the King and Queen of Hearts over the ridiculous proceedings, eventually refusing to hold her tongue. The Queen shouts her familiar "Off with her head!" but Alice is unafraid, calling them out as just a pack of cards; just as they start to swarm over her. Alice's sister wakes her up from a dream, brushing what turns out to be some leaves and not a shower of playing cards from Alice's face. Alice leaves her sister on the bank to imagine all the curious happenings for herself. In The Annotated Alice, Martin Gardner provides background information for the characters. The members of the boating party that first heard Carroll's tale show up in Chapter 3 ("A Caucus-Race and a Long Tale"). Alice Liddell herself is there, while Carroll is caricatured as the Dodo (because Dodgson stuttered when he spoke, he sometimes pronounced his last name as Dodo-Dodgson). The Duck refers to Canon Duckworth, and the Lory and Eaglet to Alice Liddell's sisters Lorina and Edith. Bill the Lizard may be a play on the name of British Prime Minister Benjamin Disraeli. One of Tenniel's illustrations in Through the Looking-Glass — the 1871 sequel to Alice — depicts the character referred to as the "Man in White Paper" (whom Alice meets as a fellow passenger riding on the train with her) as a caricature of Disraeli, wearing a paper hat. The illustrations of the Lion and the Unicorn (also in Looking-Glass) also bear a striking resemblance to Tenniel's Punch illustrations of Gladstone and Disraeli. It has been suggested by some writers that The Hatter is a reference to Theophilus Carter, a furniture dealer known in Oxford. Tenniel apparently drew the Hatter to resemble Carter, on a suggestion of Carroll's. However, it is unlikely that Carter was the model for The Hatter, and there is no evidence that Carroll ever invited Tenniel to Oxford for any purpose. The Dormouse tells a story about three little sisters named Elsie, Lacie, and Tillie. These are the Liddell sisters: Elsie is L.C. (Lorina Charlotte), Tillie is Edith (her family nickname is Matilda), and Lacie is an anagram of Alice. The Mock Turtle also sings "Turtle Soup". This is a parody of a song called "Star of the Evening, Beautiful Star", which was performed as a trio by Lorina, Alice and Edith Liddell for Lewis Carroll in the Liddell home during the same summer in which he first told the story of Alice's Adventures Under Ground. "How Doth the Little Crocodile"—a parody of Isaac Watts' nursery rhyme, "Against Idleness and Mischief"
"You Are Old, Father William"—a parody of Robert Southey's "The Old Man's Comforts and How He Gained Them"
The Duchess's lullaby, "Speak roughly to your little boy..."—a parody of David Bates' "Speak Gently"
"Twinkle, Twinkle, Little Bat"—a parody of Jane Taylor's "Twinkle Twinkle Little Star"
"The Lobster Quadrille"—a parody of Mary Botham Howitt's "The Spider and the Fly"
"'Tis the Voice of the Lobster"—a parody of Isaac Watts' "The Sluggard"
"Beautiful Soup"—a parody of James M. Sayles's "Star of the Evening, Beautiful Star"
Martin Gardner and other scholars have shown the book to be filled with many parodies of Victorian popular culture, suggesting it belongs in spirit with Gilbert & Sullivan's Topsyturveydom. Most of the book's adventures may have been based on and influenced by people, situations and buildings in Oxford and at Christ Church, e.g., the "Rabbit Hole," which symbolised the actual stairs in the back of the main hall in Christ Church. A carving of a griffon and rabbit, as seen in Ripon Cathedral, where Carroll's father was a canon, may have provided inspiration for the tale. In chapter 1, "Down the Rabbit-Hole", in the midst of shrinking, Alice waxes philosophic concerning what final size she will end up as, perhaps "going out altogether, like a candle"; this pondering reflects the concept of a limit. In chapter 7, "A Mad Tea-Party", the March Hare, the Hatter, and the Dormouse give several examples in which the semantic value of a sentence A is not the same value of the converse of A (for example, "Why, you might just as well say that 'I see what I eat' is the same thing as 'I eat what I see'! "); in logic and mathematics, this is discussing a converse relation. Also in chapter 7, Alice ponders what it means when the changing of seats around the circular table places them back at the beginning. This is an observation of addition on the ring of integers modulo N.
The Cheshire cat fades until it disappears entirely, leaving only its wide grin, suspended in the air, leading Alice to marvel and note that she has seen a cat without a grin, but never a grin without a cat. Deep abstraction of concepts, such as non-Euclidean geometry, abstract algebra, and the beginnings of mathematical logic, was taking over mathematics at the time Dodgson was writing. Dodgson's delineation of the relationship between cat and grin can be taken to represent the very concept of mathematics and number itself. For example, instead of considering two or three apples, one may easily consider the concept of 'apple', upon which the concepts of 'two' and 'three' may seem to depend. A far more sophisticated jump is to consider the concepts of 'two' and 'three' by themselves, just like a grin, originally seemingly dependent on the cat, separated conceptually from its physical object. Literary scholar Melanie Bayley asserted in the magazine New Scientist that Dodgson wrote Alice in Wonderland in its final form as a scathing satire on new modern mathematics that were emerging in the mid-19th century. It has been suggested by several people, including Martin Gardner and Selwyn Goodacre, that Dodgson had an interest in the French language, choosing to make references and puns about it in the story. It is most likely that these are references to French lessons—a common feature of a Victorian middle-class girl's upbringing. For example, in the second chapter Alice posits that the mouse may be French. She therefore chooses to speak the first sentence of her French lesson-book to it: "Où est ma chatte?" ("Where is my cat?"). In Henri Bué's French translation, Alice posits that the mouse may be Italian and speaks Italian to it. Pat's "Digging for apples" could be a cross-language pun, as pomme de terre (literally; "apple of the earth") means potato and pomme means apple. In the second chapter, Alice initially addresses the mouse as "O Mouse", based on her memory of the noun declensions "in her brother's Latin Grammar, 'A mouse – of a mouse – to a mouse – a mouse – O mouse!'" These words correspond to the first five of Latin's six cases, in a traditional order established by medieval grammarians: mus (nominative), muris (genitive), muri (dative), murem (accusative), (O) mus (vocative). The sixth case, mure (ablative) is absent from Alice's recitation. In the eighth chapter, three cards are painting the roses on a rose tree red, because they had accidentally planted a white-rose tree that The Queen of Hearts hates. Red roses symbolised the English House of Lancaster, while white roses were the symbol for their rival House of York. This scene is an allusion to the Wars of the Roses. While the book has remained in print and continually inspires new adaptations, the cultural material from which it draws has become largely specialized knowledge. Dr Leon Coward asserts the book 'suffers' from "readings which reflect today's fascination with postmodernism and psychology, rather than delving into an historically informed interpretation," and speculates that this has been partly driven by audiences encountering the narrative through a 'second-hand' source, explaining "our impressions of the original text are based on a multiplicity of reinterpretations. We don't necessarily realise we're missing anything in understanding the original product, because we're usually never dealing with the original product." Carina Garland notes how the world is "expressed via representations of food and appetite", naming Alice's frequent desire for consumption (of both food and words), her 'Curious Appetites'. Often, the idea of eating coincides to make gruesome images. After the riddle "Why is a raven like a writing-desk? ", the Hatter claims that Alice might as well say, "I see what I eat…I eat what I see" and so the riddle's solution, put forward by Boe Birns, could be that "A raven eats worms; a writing desk is worm-eaten"; this idea of food encapsulates idea of life feeding on life, for the worm is being eaten and then becomes the eater – a horrific image of mortality. Nina Auerbach discusses how the novel revolves around eating and drinking which "motivates much of her [Alice's] behaviour", for the story is essentially about things "entering and leaving her mouth". 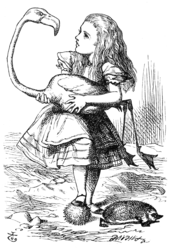 The animals of Wonderland are of particular interest, for Alice's relation to them shifts constantly because, as Lovell-Smith states, Alice's changes in size continually reposition her in the food chain, serving as a way to make her acutely aware of the ‘eat or be eaten’ attitude that permeates Wonderland. One of the author's own illustrations. The manuscript was illustrated by Dodgson himself who added 37 illustrations—printed in a facsimile edition in 1887. John Tenniel provided 42 wood engraved illustrations for the published version of the book. The first print run was destroyed (or sold to America) at Carroll's request because he was dissatisfied with the quality. The book was reprinted and published in 1866. John Tenniel's illustrations of Alice do not portray the real Alice Liddell, who had dark hair and a short fringe. Alice has provided a challenge for other illustrators, including those of 1907 by Charles Pears and the full series of colour plates and line-drawings by Harry Rountree published in the (inter-War) Children's Press (Glasgow) edition. Other significant illustrators include: Arthur Rackham (1907), Willy Pogany (1929), Mervyn Peake (1946), Ralph Steadman (1967), Salvador Dalí (1969), Graham Overden (1969), Max Ernst (1970), Peter Blake (1970), Tove Jansson (1977), Anthony Browne (1988), Helen Oxenbury (1999) and Lisbeth Zwerger (1999). The book Alice in Wonderland failed to be named in an 1888 poll of the most popular children's stories. Generally it received poor reviews with reviewers giving more credit to Tenniel's illustrations than to Carroll's story. At the release of Through the Looking-Glass, the first Alice tale gained in popularity and by the end of the 19th century Sir Walter Besant wrote that Alice in Wonderland "was a book of that extremely rare kind which will belong to all the generations to come until the language becomes obsolete". In 1865, Dodgson's tale was published as Alice's Adventures in Wonderland by "Lewis Carroll" with illustrations by John Tenniel. The first print run of 2,000 was held back because Tenniel objected to the print quality. A new edition, released in December of the same year, but carrying an 1866 date, was quickly printed. The text blocks of the original edition were removed from the binding and sold with Dodgson's permission to the New York publishing house of D. Appleton & Company. The binding for the Appleton Alice was virtually identical to the 1866 Macmillan Alice, except for the publisher's name at the foot of the spine. The title page of the Appleton Alice was an insert cancelling the original Macmillan title page of 1865, and bearing the New York publisher's imprint and the date 1866. The entire print run sold out quickly. Alice was a publishing sensation, beloved by children and adults alike. Among its first avid readers were Queen Victoria and the young Oscar Wilde. The book has never been out of print. Alice's Adventures in Wonderland has been translated into at least 97 languages, or as many as 174 languages. There have now been over a hundred editions of the book, as well as countless adaptations in other media, especially theatre and film. The book is commonly referred to by the abbreviated title Alice in Wonderland, which has been popularised by the numerous stage, film and television adaptations of the story produced over the years. Some printings of this title contain both Alice's Adventures in Wonderland and its sequel Through the Looking-Glass, and What Alice Found There. 1865: First UK edition (the second printing). 1865: First US edition (the first printing of above). 1869: Alice's Abenteuer im Wunderland is published in German translation by Antonie Zimmermann. 1869: Aventures d'Alice au pays des merveilles is published in French translation by Henri Bué. 1870: Alice's Äventyr i Sagolandet is published in Swedish translation by Emily Nonnen. 1871: Dodgson meets another Alice during his time in London, Alice Raikes, and talks with her about her reflection in a mirror, leading to another book, Through the Looking-Glass, and What Alice Found There, which sells even better. 1872: Le Avventure di Alice nel Paese delle Meraviglie is published in Italian translation by Teodorico Pietrocòla Rossetti. 1879: Соня в царстве Дива. First Russian edition of "Lewis Carroll's Alice's Adventures in Wonderland" – in Russian. 1882: Selchow & Righter publishes The Game of Alice in Wonderland, the first game based on the book. 1886: Carroll publishes a facsimile of the earlier Alice's Adventures Under Ground manuscript. 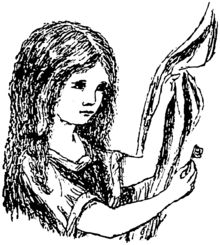 1890: Carroll publishes The Nursery "Alice", a special edition "to be read by Children aged from Nought to Five". 1899: 鏡世界. First Japanese edition of an Alice in Wonderland novel. Despite being the first Japanese version of an Alice in Wonderland novel, it is actually a translation of Through the Looking-Glass. 1906: First translation into Finnish by Anni Swan (Liisan seikkailut ihmemaailmassa). 1907: Copyright on Alice's Adventures in Wonderland expires in UK, and so the tale enters the public domain. At least 8 new editions are published in that year alone. 1910: La Aventuroj de Alicio en Mirlando is published in Esperanto translation by E. L. Kearney. 1915: Alice in Wonderland " A Dramatization of "Lewis Carroll's Alice's Adventures in Wonderland" and "Through the Looking Glass" A dramatic screenplay script rendering of Alice in Wonderland by Alice Gerstenberg; Actress Vivian Tobin; copyright A. C. McClurg & Co., Chicago 1915, Produced by The Players Producing Company of Chicago (Aline Barnsdall and Arthur Bissell), at the Fine Arts Theater, Chicago, 2/11/1915, Booth Theater, New York, 3/23/1915. 1916: Publication of the first edition of the Windermere Series, Alice's Adventures in Wonderland. Illustrated by Milo Winter. 1928: The manuscript of Alice's Adventures Under Ground that Carroll wrote and illustrated and that he had given to Alice Liddell was sold at Sotheby's on 3 April. It sold to Philip Rosenbach for £15,400, a world record for the sale of a manuscript at the time. 1945: The animated picture book of Alice in Wonderland, with illustrations and paper engineering by Julian Wehr is published. 1960: American writer Martin Gardner publishes a special edition, The Annotated Alice, incorporating the text of both Alice's Adventures in Wonderland and Through the Looking-Glass. It has extensive annotations explaining the hidden allusions in the books, and includes full texts of the Victorian era poems parodied in them. Later editions expand on these annotations. 1961: The Folio Society publication with 42 illustrations by John Tenniel. 1988: Carroll and Anthony Browne, illustrator of a new edition from Julia MacRae Books, win the Kurt Maschler Award, or the Emil, for the year's best British "work of imagination for children, in which text and illustration are integrated so that each enhances and balances the other." 1998: Lewis Carroll's own copy of Alice, one of only six surviving copies of the 1865 first edition, is sold at an auction for US$1.54 million to an anonymous American buyer, becoming the most expensive children's book (or 19th-century work of literature) ever sold, up to that time. 1999: Carroll and Helen Oxenbury, illustrator of a new edition from Walker Books, win the Kurt Maschler Award for integrated writing and illustration, as did Anthony Browne and the 1988 Julia MacRae edition. 2007: For the 50th anniversary of the British Kate Greenaway Medal (1955–2005), a panel of experts names the 1999 Walker Books edition illustrated by Helen Oxenbury one of the top ten Medal-winning works, composing the ballot for a public election of the all-time favourite. 2008: Folio Alice's Adventures Under Ground facsimile edition (limited to 3,750 copies, boxed with The Original Alice pamphlet). 2009: Children's book collector and former American football player Pat McInally reportedly sold Alice Liddell's own copy at auction for $115,000. Alice in Wonderland (1944) TV adaptation of Eva La Gaillenne's stage version of both books, USA. Alice in Wonderland and Through the Looking-Glass (1948) BBC TV broadcast. Through the Crystal Ball: Alice in Wonderland (1949) US TV performance. Alice in Wonderland (1951), a film version in traditional animation from Walt Disney Feature Animation. Arguably the most well known of the Alice film adaptations, and today considered one of Disney's great classics. Alice in Wonderland (1954) BBC broadcast of a ballet version. Alice au pays des merveilles (1972), a version made for television, by Jean-Christophe Averty. Nel Mondo Di Alice (In the World of Alice) Italian TV series in 4 parts. Alice in Wonderland (1934-1935) was a comic strip adaptation drawn by Edward D. Kuekes and written by Olive Ray Scott. This version also featured a "topper" strip, Knurl the Gnome. The strip was distributed by United Feature Syndicate. The first full major production of 'Alice' books during Carroll's lifetime was Alice in Wonderland, a musical play by H. Saville Clark (book) and Walter Slaughter (music), which played in 1886 at the Prince of Wales Theatre in London. As the book and its sequel are Carroll's most widely recognised works, they have also inspired numerous live performances, including plays, operas, ballets, and traditional English pantomimes. These works range from fairly faithful adaptations to those that use the story as a basis for new works. An example of the latter is The Eighth Square, a murder mystery set in Wonderland, written by Matthew Fleming and music and lyrics by Ben J. Macpherson. This goth-toned rock musical premiered in 2006 at the New Theatre Royal in Portsmouth, England. The TA Fantastika, a popular Black light theatre in Prague performs "Aspects of Alice"; written and directed by Petr Kratochvíl. This adaptation is not faithful to the books, but rather explores Alice's journey into adulthood while incorporating allusions to the history of Czech Republic. Over the years, many notable people in the performing arts have been involved in Alice productions. Actress Eva Le Gallienne famously adapted both Alice books for the stage in 1932; this production has been revived in New York in 1947 and 1982. One of the most well-known American productions was Joseph Papp's 1980 staging of Alice in Concert at the Public Theater in New York City. Elizabeth Swados wrote the book, lyrics, and music. Based on both Alice's Adventures in Wonderland and Through the Looking-Glass, Papp and Swados had previously produced a version of it at the New York Shakespeare Festival. Meryl Streep played Alice, the White Queen, and Humpty Dumpty. The cast also included Debbie Allen, Michael Jeter, and Mark Linn-Baker. Performed on a bare stage with the actors in modern dress, the play is a loose adaptation, with song styles ranging the globe. A community theater production of Alice was Olivia de Havilland's first foray onto the stage. Similarly, the 1992 operatic production Alice used both Alice books as its inspiration. It also employs scenes with Charles Dodgson, a young Alice Liddell, and an adult Alice Liddell, to frame the story. Paul Schmidt wrote the play, with Tom Waits and Kathleen Brennan writing the music. Although the original production in Hamburg, Germany, received only a small audience, Tom Waits released the songs as the album Alice in 2002. A musical adaption was written by Michael Sirotta and Heather M. Dominick in 1997, titled Alice in Wonderland, a Musical Adventure. A ballet by Christopher Wheeldon and Nicholas Wright commissioned for The Royal Ballet entitled "Alice's Adventures in Wonderland" premiered in February 2011 at the Royal Opera House in Covent Garden, London. The ballet was based on the novel Wheeldon grew up reading as a child and is generally faithful to the original story, although some critics claimed it may have been too faithful. The ballet overall stays generally light hearted for its running time of an hour and forty minutes. The ballet returned to the Royal Opera House in 2012. Alice and the rest of Wonderland continue to inspire or influence many other works of art to this day, sometimes indirectly via the 1951 Disney movie, for example. References, homages, reworkings and derivative works can be found in many works of literature, film, theatre, visual art, music, and games. The character of the plucky, yet proper, Alice has proven immensely popular and inspired similar heroines in literature and pop culture, many also named Alice in homage. ^ "The real Alice". Story Museum. Archived from the original on 17 November 2010. Retrieved 24 April 2010. ^ The Background & History of Alice In Wonderland. Bedtime-Story Classics. Retrieved 29 January 2007. ^ Everson, Michael (2009) "Foreword", in Carroll, Lewis (2009). Alice's Adventures under Ground. Evertype. ISBN 978-1-904808-39-8. ^ Brooker, Will (2004). Alice's Adventures: Lewis Carroll in Popular Culture. New York: Continuum. pp. 69–70. ISBN 978-0-8264-1433-5. ^ a b Coward, Leon (November 2015). "Alice in Wonderland: 150 years". The Greek Australian Vema. Sydney, Australia: St Andrews Orthodox Press. p. 18. ^ "Ripon Tourist Information". Hello-Yorkshire.co.uk. Archived from the original on 26 November 2009. Retrieved 1 December 2009. ^ a b Gardner, Martin (1990). More Annotated Alice. New York: Random House. p. 363. ISBN 978-0-394-58571-0. ^ Bayley, Melanie (6 March 2010). "Algebra in Wonderland". The New York Times. Archived from the original on 12 March 2010. Retrieved 13 March 2010. ^ Bayley, Melanie. "Alice's adventures in algebra: Wonderland solved". New Scientist. Retrieved 21 August 2012. ^ Lewis Carroll (2009). Alice's Adventures in Wonderland and Through the Looking-Glass. Oxford University Press. ISBN 978-0-19-955829-2. ^ "Other explanations | Lenny's Alice in Wonderland site". Alice-in-wonderland.net. Retrieved 4 September 2010. ^ Garland, C. (2008). "Curious Appetites: Food, Desire, Gender and Subjectivity in Lewis Carroll's Alice Texts". The Lion and the Unicorn. 32: 22. doi:10.1353/uni.2008.0004. ^ Boe Birns, Margaret (1984). "Solving the Mad Hatter's Riddle". The Massachusetts Review. 25 (3): 457–468 (462). JSTOR 25089579. ^ Auerbach, Nina (1973). "Alice and Wonderland: A Curious Child". Victorian Studies. 17 (1): 31–47 (39). JSTOR 3826513. ^ Lovell-Smith, R. (2004). "The Animals of Wonderland: Tenniel as Carroll's Reader". Criticism. 45 (4): 383. doi:10.1353/crt.2004.0020. ^ Ovenden, Graham (1972). The Illustrators of Alice. New York: St. Martin's Press. p. 102. ISBN 978-0-902620-25-4. ^ "Alice in Wonderland". QI. Quite Interesting Ltd. Retrieved 15 April 2017. ^ Tucker, Rebecca (25 February 2011). "Oscar Reads: Alice's Adventures in Wonderland, by Lewis Carroll". Retrieved 15 April 2017. ^ Bandersnatch: The Newsletter of The Lewis Carroll Society, Issue 149 (January 2011), p. 11. ^ "Alice in a World of Wonderlands - The Books". aliceinaworldofwonderlands.com. ^ Carroll, Lewis (1995). The Complete, Fully Illustrated Works. New York: Gramercy Books. ISBN 978-0-517-10027-1. ^ "Lewis Carroll's Alice's Adventures in Wonderland – in German". ^ "Lewis Carroll's Alice's Adventures in Wonderland – in French". ^ "Lewis Carroll's Alice's Adventures in Wonderland – in Swedish". ^ "Lewis Carroll's Alice's Adventures in Wonderland – in Italian". ^ "Pastimes: Children's Games and Their Literary Inspirations". Indiana University. Retrieved 9 October 2012. ^ Page 11 of Introduction, by John Davies, of Ovenden, Graham (1972). The Illustrators of Alice. New York: St. Martin's Press. p. 102. ISBN 978-0-902620-25-4. ^ Basbanes, Nicholas (1999). A Gentle Madness: Bibliophiles, Bibliomanes, and the Eternal Passion for Books. Macmillan. ISBN 978-0-8050-6176-5. ^ Wehr, Julian; Carroll, Lewis. The animated picture book of Alice in Wonderland. Retrieved 12 December 2016. ^ a b "Kurt Maschler Awards". Book Awards. bizland.com. Retrieved 7 October 2013. ^ "Auction Record for an Original 'Alice'". The New York Times. 11 December 1998. p. B30. ^ "70 Years Celebration: Anniversary Top Tens" Archived 27 October 2016 at the Wayback Machine. The CILIP Carnegie & Kate Greenaway Children's Book Awards. CILIP. Retrieved 7 October 2013. ^ "Real Alice in Wonderland book sells for $115,000 in USA". BBC News. 17 December 2009. Retrieved 8 January 2012. ^ Mills, Ted (31 March 2016). "The First Film Adaptation of Alice in Wonderland (1903)". Open Culture. Retrieved 19 May 2017. ^ "Phantomwise". Phantomwise. Retrieved 23 April 2016. ^ "Alice's Adventures in Wonderland and Through the Looking-Glass". British Universities Film & Video Council. Retrieved 6 July 2017. ^ Louis Peitzman, "17 Adaptations Of "Alice's Adventures In Wonderland" Through The Years", BuzzFeed (11 October 2013), describing the 1951 Disney film as "undoubtedly the most well known". ^ "All-in-the-golden-afternoon96, still-she-haunts-me-phantomwise: London's..." All-in-the-golden-afternoon96. Retrieved 23 April 2016. ^ "Ed Kuekes". Lambiek Comiclopedia. Lambiek. 11 April 2008. Retrieved 9 August 2017. ^ "Winter Children's Theatre "Alice in Wonderland" Runs Through March 24th". North Coast Oregon. Retrieved 9 January 2015. ^ "First Redeemer conservatory of music and fine arts presents Alice in Wonderland". APPEN MEDIA GROUP. Retrieved 9 January 2015. ^ "Royal Ballet Takes a Chance on Alice". Time. 3 March 2011. ^ "Joby Talbot – Alice's Adventures in Wonderland (2010) – Music Sales Classical". Chesternovello.com. Retrieved 4 August 2013. ^ Sulcas, Roslyn (1 March 2011). "'Alice in Wonderland' at the Royal Ballet – Review". The New York Times. ^ "Calendar < Events - Royal Opera House < August 2013". Roh.org.uk. Retrieved 4 August 2013. Carpenter, Humphrey (1985). Secret Gardens: The Golden Age of Children's Literature. Houghton Mifflin. ISBN 978-0-395-35293-9. Gardner, Martin (2000). The Annotated Alice: the definitive edition. New York and London: W. W. Norton & Company. ISBN 978-0-393-04847-6. Ray, Gordon Norton (1991). The Illustrator and the book in England from 1790 to 1914. New York: Dover. ISBN 978-0-486-26955-9. GASL.org: First editions of Alice's Adventures in Wonderland and Through the Looking-Glass, and What Alice Found There With 92 Illustrations by Tenniel, 1866/1872. Afterlife of Alice and Her Adventures in Wonderland is a collection of various editions of Alice's Adventures in Wonderland, Through the Looking-Glass, What Alice Found There, and other similar works.